At the end of 2015, high-income countries reporting to Quarterly External Debt Statistics (QEDS) recorded a 4.2 percent decline in their combined gross external debt position to $67.5 trillion from the comparable figure at end 2014 (Figure 1). This marked the second consecutive year that the external debt stock of these countries has declined after peaking at $71.7 trillion in 2013. Most high-income saw a fall in external debt stock and in some instances it was significant: eighteen of the forty-five countries reporting to QEDS recorded a reduction in external debt stock of more than 10 percent in 2015. While this was in part a reflection of changes in the valuation of national currencies vis-à-vis the US dollar (the QEDS reporting numeraire) it also reflects a continuation of consolidated efforts to reduce public debt burdens. Iceland was in a league of its own, posting a 68 percent fall in gross external debt stock in 2015 thanks to a sizeable increase in its non-borrowed foreign exchange reserves. This enabled pre-payment of a bilateral loan from Poland, the Avens Bond, held by domestic pension funds and some Eurobonds through a $500 million debt buyback operation. A small number of countries recorded a relatively moderate rise in external debt stock in 2015. Japan, Argentina and Switzerland posted the largest increase, up 8.2 percent, 7.9 percent and 5.6 percent respectively from the end 2014 level. The overall decline in high-income countries’ gross external debt position was driven by a contraction in the external debt liabilities of deposit-taking corporations (except central banks), comprised of primarily commercial banks. These fell by $1.9 trillion, equivalent to 8 percent, in 2015 to $21.3 trillion at year end (Figure 2). A contributing factor was the $0.7 billion (4.2 percent) decline in general government external debt stock to $15.3 trillion. Most high-income countries recorded a reduction in general government external debt stock in 2015 but, in contrast, Japan and the United Kingdom recorded increases of 17 percent and 8 percent, respectively over the same period. The United States of America, which accounts for 41 percent of the combined general government external debt of all high-income countries reporting to QEDS, also saw a moderate, 0.9 percent increase in this category of debt in 2015. In all three countries, the increase was attributable primarily to a rise in short-term debt securities. The Quarterly Public Sector Debt (QPSD) Initiative launched by the World Bank in December 2010, in cooperation with the International Monetary Fund (IMF), aims to provide comprehensive, timely and internationally comparable information on central and general government debt and more broadly, debt of the public sector for both industrialized, high income countries as well as those classified as low- and middle-income. The initiative is a response to recommendations by the Inter-Agency Group (IAG) on Economic and Financial Statistics and the imperative to address important gaps in international data systems highlighted by the global financial and economic crisis that erupted in 2008. A core aim of the QPSD Initiative is to institute a standardized measure for each dimension of public sector debt. Information in the QPSD database covers all relevant sectors of the economy: (1) general government, (2) central government, (3) budgetary central government, (4) non-financial public corporations (5) financial public corporations, and (6) the total consolidated public sector debt. The instrument coverage for each sector is identical, comprising of (1) debt securities, (2) loans, (3) currency and deposits, (4) Special Drawing Rights, (5) other accounts payable, and (6) insurance, pensions, and standardized guarantee schemes. Like with the Quarterly External Debt Statistics (QEDS) reporting to the QPSD is voluntary but countries are actively encouraged to participate, with the central and lately the general government being the minimal requirements to participate in the initiative. To date, a total of 82 countries provide quarterly information on their public debt. Of these reporting countries, 49 percent are classified as high-income and 51 percent constitute low- and middle-income countries. While most countries that have committed to report to the QPSD do so on a regular basis most still find it a challenge to provide data that covers all sectors of the economy and all borrowing instruments. Relatively few countries are found to have the capacity or resources to compile fully comprehensive gross debt statistics as defined in the Public Sector Debt Statistics Guide for Compilers and Users (PSDS Guide) and in the Government Finance Statistics Manual 2014 (GFSM 2014). Typically reports to the QPDS consist of only two, out of six, types of instruments - debt securities and loans. 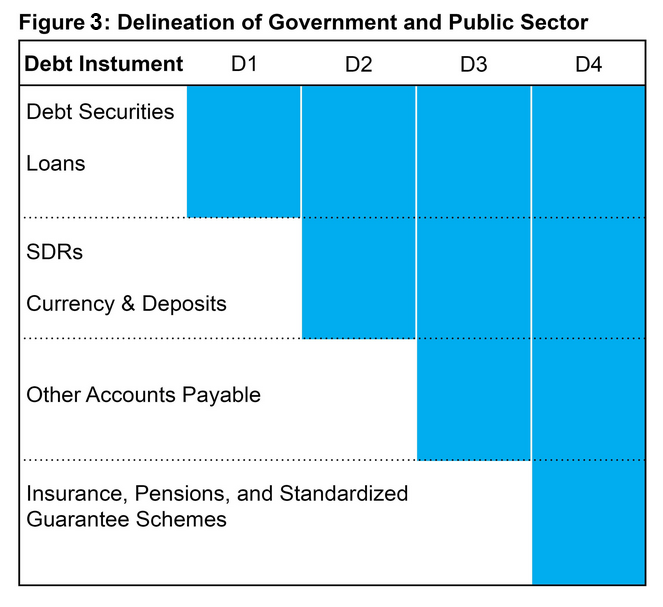 The D1-D4 presentation classifies gross government debt and public sector debt into four categories, as defined in the 2012 IMF Staff Discussion Note: “What Lies Beneath: The Statistical Definition of Public Sector Debt”. Under this classification system the coverage of instruments ranges from a narrow definition that includes only debt securities and loans (D1) to a fully comprehensive definition that covers all six types of instruments (D4), described above and defined in full detail in the PSDS Guide and GFSM 2014. D1 comprises debt securities and loans, and constitutes the largest share of public debt. D2 comprises all D1 instruments, plus SDR holdings and currency and deposits. In the majority of countries, these are held by the central bank and classified under the sector ‘financial public corporations.’ D3 includes other accounts payable (in addition to all instruments captured by D2), and provides an important indicator of crisis in periods of financial distress. Finally, D4 covers all six debt instruments, including Insurance, Pensions and Standardized Guarantee Schemes (IPSGS) in addition to the indicators covered under D3. As evidenced by the recent financial crisis, IPSGS can pose a significant financial risk. However, the difficulties of compiling a comprehensive statistical measurement of such obligations is recognized. Figure 3 illustrates how the D1-D4 categories are delineated: the area shaded in blue indicates which instruments are included in each category. The D1-D4 matrix-based approach for the presentation of government and public sector debt data satisfies a dual objective. It provides users with the maximum level of transparency across all dimensions, and, in parallel, it allows countries that have agreed to report to the QPSD to assess their own reporting standards and level of disaggregation, relative to those of other QPSD reporters and against the internationally agreed standards. D1-D4 indicators are calculated for both the general government and the central government for all quarters for which data are available. These indicators are part of the QPSD database and may be accessed through the pre-built reports. These are available at the World Bank's QPSD Debt Data portal at http://datatopics.worldbank.org/debt/qpsd. A detailed note on the methodology underpinning the country specific calculation rules and valuation methods is also available at: http://databank.worldbank.org/data/download/debt/Measuring_Government_Debt_D1-D4.pdf. The QPSD database may also be accessed through the World Bank Open Data site at http://databank.worldbank.org/ under “Quarterly Public Sector Debt”. Bond issuance remained an important source of external financing for low- and middle-income countries in 2015, but the pace of new issuance slowed sharply. According to data compiled by Dealogic, from creditor and other market-based sources, overall bond issuance by low- and middle-income countries totaled around $213 billion in 2015, 20 percent below the comparable figure for 2014 (Figure 4). Of the total 2015 issuance, 52 percent was accounted for by borrowers in the East Asia and Pacific region. Much of the decline was due to a sharp cutback in issuance by private sector non-guaranteed corporate borrowers across all major borrowers. It fell 45 percent in 2015 with new issuance down 63 percent in Europe and Central Asia, 57 percent in Latin America and the Caribbean, primarily Brazil and Mexico, and 50 percent in the East Asia and Pacific region from the comparable level in 2014. Issuance by sovereign and other public sector borrowers fared better and fell only 7 percent in 2015. However, this was largely due to a surge in new issues by public sector borrowers in East Asia and the Pacific region, which was up 44 percent from 2014 offsetting sharp declines in Latin American and European and Europe and Central Asia. Sovereign borrowers in Sub-Saharan Africa, excluding South Africa, issued Eurobonds totaling $6 billion in 2015, on par with the comparable figure for 2014 and including debut issues by Angola ($1 billion) and Cameroon ($750 million) (Figure 5). In the past decade fifteen Africa countries (aside from South Africa), including nine that have benefitted from the Heavily Indebted Poor Countries (HIPC) Initiative, have issued Eurobonds at values typically ranging from $500 million to $1 billion. At end 2015 the cumulative outstanding value was around $21 billion, equivalent to an estimated 15 percent of the issuing countries combined stock of long term external public debt. Access to markets came at a higher cost with plunging commodity prices, slow global growth, and investor concerns over deteriorating economic indicators of countries in the region pushed coupon rates to record highs. Ghana’s $1 billion 15 year 10.75 percent issue in October 2015 marked the fourth time the country has come to the market since 2007. The maturity was the longest achieved by a Sub-Saharan African country to date (excluding South Africa). However the issue also offered the highest yield, a partial risk guarantee from the World Bank notwithstanding. It was a similar story for Zambia, which issued a $1.25 billion 10 year bond in July 2015 at a yield of 9.375 percent, 75 basis points more than it paid for similar issue in 2014. The Inter-Agency Task Force on Financial Statistics (TFFS) meeting, hosted by the IMF, took place in Washington, D.C. on March 17–18, 2016. Participants at the meeting underscored the importance accorded by their respective institutions, and the international community at large, to the compilation and dissemination of debt statistics and the widespread demand for comprehensive and timely data on both public and external debt. TFFS members agreed on a medium-term strategy that will support the substantial progress already achieved in the Quarterly External Debt Statistics (QEDS) and Public Sector Debt Statistics (PSDS) and, at the same time, take these initiatives to the next level. Key objectives, going forward, were identified as: (a) increasing the number of countries reporting the QEDS and PSDS; (b) enhancing the consistency of data reporting and coherence with broader macroeconomic datasets; and (c) raising user awareness of the users of the availability, scope and special features of external and public debt statistics. In this context, the participants expressed their appreciation to the World Bank for launching its quarterly online Debt Bulletin which they regard as an important tool for communicating with users and educating them in the myriad of ways they can make use of debt data and trends made available to them. TFFS agencies set up an Engagement Group charged with formulating a work program to achieve the stated objectives and prioritizing the order in which countries are targeted. Participants signaled that, consistent with the Data Gaps Initiative (DGI) Phase II, the first priority should be G-20 countries that are either not yet reporting to QEDS and PSDS or reporting intermittently or partially. The overarching aim is to develop a systematic and coordinated approach to maximizing the coverage and quality of reporting by all high-, low-, and middle-income countries.